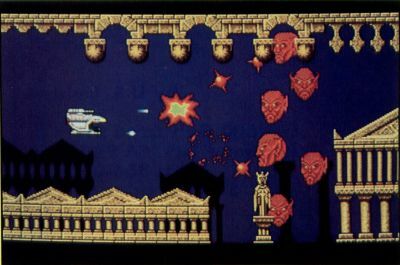 In the finest tradition of horizontally scrolling arcade games such as Defender, Gradius and Life Force, Menace explodes on the 68000 microcomputer scene. Using the advanced graphics and speed available on the Atari ST family of home computers, Psygnosis has brought arcade enthusiasts a wonderful diversion from the action/strategy games they have become famous for. At last, an intense, albeit mindless, shoot 'em up that truly utilizes the 68000 microchip to its fullest! Menace's documentation informs the player that the inhabitants of the planet Draconia have become the most feared and ruthless plunderers of known space. Ousted from their home planets, they have formed an alliance of terror and have taken the planet Draconia as their home base. You must put an end to their reign of terror. While a large-scale attack might prove too costly, the free worlds are always willing to sacrifice a single ship and its pilot—you! Also, it is assumed that a single attacker might be able to approach almost undetected. For this reason, a space slug has been captured. Your ship will hide in the maw of the slug. It will then be controlled remotely, to the planet Draconia. At the appropriate time, a signal will be sent that will cause the slug's mouth to open, at which time you will be free to engage the enemy. Draconia consists of six zones; Sea of Karnaugh, Vanguard Warzone, Carnage Rift, Tropics of Mace, Ruins of Kruger and Plateaus of Draconia. Destruction of all six will leave the planet totally vulnerable to attack. As mentioned, Menace provides six levels of progressive difficulty. In addition, two difficulty settings are possible: novice and expert. In the novice level, only collisions with aliens and guardians reduce your shields. In the expert level, collisions with scenery will also reduce your shields. What this really means is that there are twelve levels of progressive difficulty. There are 60 different animated aliens to conquer along the way, and an all-powerful "guardian" to combat at the end of each level. All of these features considered, Menace should give you many hours of interesting play. Menace uses ultra-smooth parallax scrolling to paint its intriguing screens. Parallax scrolling refers to the slight difference in scrolling speed between the foreground and background. Your eyes perceive this difference and translate it into greater depth, the impression of a third dimension. Disney Studios pioneered this technique, which then gave its flat cartoon animation some feeling of depth. Menace features a continuous sound track that can be disabled when it starts to grate on the nerves. Sampled effects and speech are also included. Both mouse and joystick controls are allowed. Each are good, and neither present any real difficulties for the gamer. The high scores can be saved to Disk B of the two disk set, if the write protect tab is placed to "write enable." There is a nice restart feature that arcade purists will really appreciate. As with arcade games such as Lock-On, the player is allowed to restart at the current level in which his last ship was lost. Any special weapons collected along the way are lost, however, if this option is selected. Another nice feature is the aforementioned ability to collect superior weapons, for use on your own craft. The manual justifies this by saying that you have on board the latest in matter converter weapons. These weapons allow you to change the molecular structure of space debris by continually bombarding it with high-energy shots. By picking up the debris when it is in usable form, you may build and replenish extra weapons. 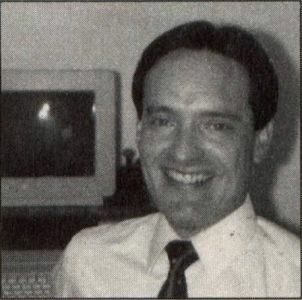 The computer will generate images for you, showing you when to pick up the debris for specific weapons. In reality, here is what happens: Destroying an entire wave of attacking Draconians will cause an icon to appear on the screen. Firing at the icon five times will cause it to change into another icon depicting a different weapon. You may collect the weapon depicted simply by flying over the icon. Icons are provided for additional bonus points, cannons (short-range weapons), lasers (long-range weapons, especially useful against guardians) and outriders. The out riders are probably the most interesting and useful. They are externally mounted droids that can fire at adjustable angles, as opposed to the lasers and cannons that can be fired only horizontally. Finally, icons representing speed boosters, force fields and full shield recovery are available. While the program disks are copy protected, the Menace's reasonable price makes up for this inconvenience. The animation of the on-screen aliens and attackers is really worth the price of admission. Menace is the kind of game that makes the ST look so much more impressive than Nintendo and Sega home entertainment systems. Not that I am advocating the ST as a game machine, but for those who like games, while really needing more than a static game machine, it's still nice to know that the ST plays the best games available today. Menace rates a solid A! The bottom line: Buy it.